Last week was not great for this zoo rabbi. One of my hyraxes, named Lorax, escaped, and despite the best efforts of my neighbors and myself to recapture it, our efforts proved fruitless. Then my fruit bat, Batsheva, escaped, and although I managed to recapture her two days later, her experiences left her in bad shape and she expired. And to top it all, I hadn't made it to the South to catch the locusts that had arrived in a plague from Egypt. 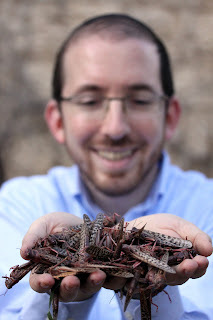 The article about kosher locusts that I had written for The Times of Israel had been quoted by media outlets all over the world, but I hadn't actually gotten any! My students were begging me for a lecture on kosher locusts, and my chameleons, for whom locusts are a favorite food, were looking at me with accusing eyes (which, protruding from their heads, are particularly unsettling). And the Ministry of Agriculture reported that they had successfully fumigated all the locusts that had flown in from Egypt. Which was wonderful news for the farmers and the economy - let's not lose perspective here! - but not for my chameleons, my students and me. And so, late last night, we planned our expedition. The latest reports indicated that a small swarm had settled in Nachal Lavan, near the Egyptian border. The Ministry of Agriculture were sending planes on Sunday morning to fumigate them. We would have to make an early start - partly because locusts can best be captured when they are dormant from the cold of night, and partly in order to get them before they were sprayed with pesticide! At five o'clock this morning, Moishe and I hit the road. It's possible to drive incredibly fast at that hour, even while simultaneously scanning the road for hedgehogs and hyenas. There's also a new, wide bypass road that circumvents Be'er Sheva, speeding up the journey considerably. As we entered the Negev desert, a number of signs on the road warned of danger from camels crossing the road - their bodies are so high from the ground that if you hit one, it comes straight through the windshield. We didn't have that experience, which was fortunate for us, and also for the camels. The desert itself was vast and bare, with herds of oryx conspicuously failing to thunder across it. We made excellent time, but the sun had already come up, and it was going to be close. I didn't yet realize just how close it was going to be. I found the rough road leading off the highway towards Nachal Lavan, and we began to travel down it. A large four-wheel drive vehicle was coming in the other direction, and we drove past it. In the rear-view mirror, I saw it turn around. I pulled over to the side as it drew up next to my car. "Hi," I said brightly. "We're looking for locusts! Do you know where we can find them?" The man in the other car, who was apparently from the Ministry of Agriculture, was not happy with me. "You have to leave this area right now," he said. "In two minutes, it's going to be fumigated." "Okay," I said in disappointment. And he drove off. This was very upsetting. But meanwhile, Moishe from Australia had gotten out of the car, and he was peering into the bushes that were a short distance from us. "Crikey," he said, or some such Australian expression of astonishment, "This bush is full of locusts! Strewth! Blimey!" Or words to that effect. Pesticides or not, I wasn't going to miss this opportunity. I grabbed a collecting box from the back of the car and made my way to the bush. There were locusts all over the branches! At that point, two things happened simultaneously. I heard a voice thundering, "GET BACK IN THE CAR NOW!" It sounded like the Lord Himself speaking from the Heavens, but it was in fact the Ministry official, who had returned to check that I had left, and was shouting from a loudspeaker mounted on his truck. Then, at the same moment, there was a noise like a hundred thousand beating wings. I looked up, but instead of seeing a black cloud of locusts, I saw two planes swooping towards me, spraying pesticides as they approached. It was like a scene from a movie. Moishe and I grabbed some locusts in our hands, and with fistfuls of bugs, we ran back to the car and slammed the doors closed. The Ministry Man was shouting something about my being fined, the planes swooped overhead, and I stepped on the gas and raced out of there. Being killed by pesticides would not be a great way to go. Can you imagine the headlines? "Zoo Rabbi Fumigated in Locust-Hunting Expedition. 'He Really Bugged Us,' Say Opponents." Well, that was the end of our success for this morning. We drove around further, but we found nothing other than countless more locusts that had already been fumigated. They were lying on the ground, twitching, and I took a few dozen; I can't even feed them to my reptiles, but perhaps when they stop twitching, I can pin them to a card and sell them as souvenirs for the Jewish Museum of Natural History. We had managed to collect a total of seven live, unfumigated locusts in the approximately five seconds of time that we had, and I'm hoping to start a breeding colony. Here's to happy times all round! Picture is for display purposes only. Do not eat fumigated locusts! Are you sure it's avoid idea to be breeding locusts in beit shemesh? Do you think Dr. Seuss had the Hyrax in mind when he coined the pormenteau "Lorax"? My Yemenite and Sabra cookery book says locusts should be put into a hot oven for half a day then spread out to dry in the sun for one day. Before eating, remove head, legs and wings. 2 kgs of locusts should serve 4. So how many laws in, including speeding violations, of the State did you violate on this selfish adventure? I looked up, but instead of seeing a black cloud of locusts, I saw two planes swooping towards me, spraying pesticides as they approached. Methinks you should not touch the fumigated locusts or hand them out to unsuspecting visitors to your museum. The fumigation toxins are probably skin permeable. We were in a park in Rehovot on Shabbat and thought we saw a bat, and then thought it was a large mantis but when it landed we saw it was a healthy locust. The pesticides never get all of them. Brilliant post! Love the Douglas Adams devices. Reminds me if a trip we once made to the Irwell to collect frogs. Hope you're more successful than we were back then. And, grumpy mb, I'm sure they didn't violate any laws. You can go at 110kmph on the new highways ... and anyway they must have been hungry for breakfast. nicely written but I still think I might be sick! Unknown - 'dinner demalchuta dinner' - classic line!! I bet Chagavim would taste great as a pizza topping. May Hashem bless your locust breeding, and may I be zoche to munch on the next batch with you. For the next adventure I'd like to hunt for the native Israeli rabbit with Dr Betech. Will prpbably be safer. why only fumigated locusts should one not eat? last i checked according to ashkenezic poskim (such as Taz, aruch hashukchan - and even pri toar -ohr hachaim hakadosh)it was ASSUR! so unless you are teimani - i think that your public locust eating actions and moreh hetter rationalizations is akin to saul berlin's (now there's one for your brand of rationalist judaism)claim that the ashkenazic rishonim got it all wrong about kitniyos - and really it wss the karaites who made it - so we don't have to keep it. i think you owe it to your loyal readership to explain how arbitrarily you just pick and choose which halachos to follow and which to say - naa they just didnt know what they were talking about - i dont need to listen to them! mb (leaving his saracasm aside) raises a point I've long wondered about: Does dina d'malchusa dina mean that we must follow every single law? Or does it just generally mean that we should be law-abiding citizens? The implications ar obvious. Tons of law-abiding citizens speed and jay-walk even though doing so is technically illegal. I lean toward belieiving that dina d'malchusa dina just generally means "be a good law-abiding citizen." I wonder if anyone on this blog has insight on this topic. last i checked according to ashkenezic poskim (such as Taz, aruch hashukchan... it was ASSUR! I'm thinking that this is what the guy from the ministry of agriculture was so peeved about. He should have told you "drop those chagavim, you pale-skinned Teimani wannabe! " i read your pathetic excuse for a 'rationalistic' justification for your locust eating and that is exactly why i commented in the first place. i truly hope that you wont end up like good ol' saul. [seems to be a good role model for you now]. now i see that you truly went off the deep end, and the natan that i remember from the mir is sadly no longer. Following a psak = "pathetic excuse for a justification"
Analyzing the issue in depth based on sources and zoology = "pathetic excuse for a justification"
Issuing invective such as "pathetic excuse for a justification" = solid halachic position. obviously you have not been following the shakla vtarya on this and the last few posts regarding locusts here and on zoo torah. i wrote that ashkenazic poskim plus the ohr hachaim wrote that nowadays locust eating is assur. natan tried to get around it bu responding that i should check previous post for his rationalizing why even so nowadays he holds that it is muttar and in fact acts upon his convictions [based on his own words the psak from his anonymous rabbi does not seem to be the true reason why he engages in locust munching]. to that i replied that i had already read that and i found his justification pathetic from a mesoradic and halachic standpoint - referencing that the infamous saul berlin (among many other things he did)tried to get ashkenazim to start eating kitniyos on pesach -[nice haskalah move] by saying that according to his research it was actually started by karaites, and therefore has no halachic standing. fortunately he was debunked, and defrocked. my point that once one starts being moreh hetter - its a very slippery slope - and in my eyes - for an ashkenazi who has no intrinsic mesorah on locusts to go against such gedolei hadoros and publicly eat them in the name of rationalism is an abhorrence. y'know - zimri also asked moshe rabbeinu [do you hold of him?) before maaseh kozbi - is this muttar or assur and then acted upon his rationalizations. last i heard it did not turn out too well for him either. Insisting on maintaining an issur on locusts in the present-day seems, at some level, a little chauvinistic -- doesn't it? It's like saying that those communities that do eat locusts have a fraudulent mesorah. If the Taz or the Aruch ha-Shulchan moved to an area where there were locust-eating Teimanim nearby, would they still have ossured that practice? The ohr hachaim was already dealt with. The ashkenazi poskim wrote that in their time and place they did not know the identity of the kosher locusts. Which nobody is disputing. They did not say that it would be impossible for anyone to know it. I believe that at the last Se'udath Halakhah, the chef sauteed them. He said they tasted like Bisli grill flavor. Remove head and front four legs first. BTW, if one more person says that "din malkhut dina" has ANYTHING to do with living in Eretz Yisrael, I think I'll scream. Perhaps, R' Slifkin can tell us about the suggiyah in the Bavli, and its not so mysterious absence from the Yerushalmi.